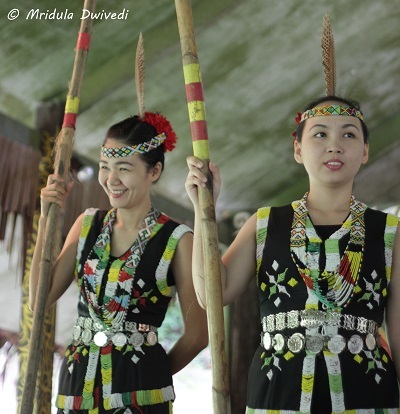 When I saw Mari Mari Cultural Village on my Sabah itinerary I was curious about the experience. Would it be a tourist trap? I went in expecting it to be one, but I came back pleasantly surprised. We arrived at the Mari Mari Cultural Village for the morning slot. It was raining. We were a little early so we waited near the ticket counter area. There was a cat playing with people. 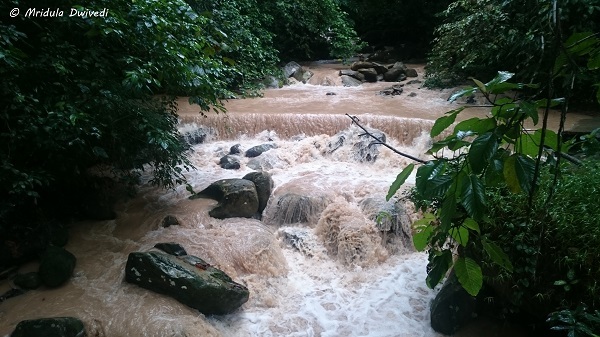 The village is about 25 minutes drive from Kota Kinabalu. 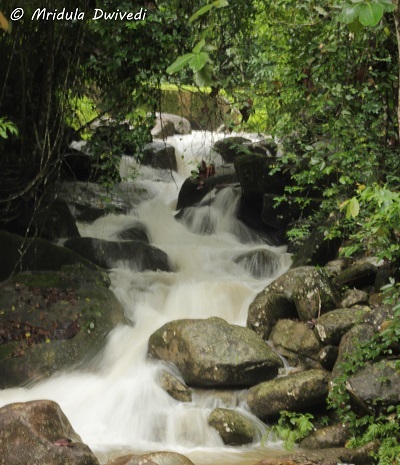 It is set in a green area which makes it even more special. AK our guide came along and herded us near the entrance. He asked if we knew what Mari Mari means. It means ‘come come,’ I knew it because the guide for our whole trip, John, mentioned it earlier. 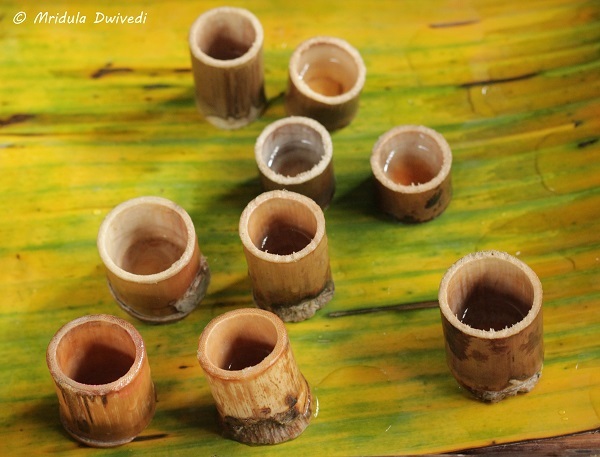 Later when we would linger around a house and not budge, AK would say ‘mari mari’, let’s go to the next one! However he wanted a leader among us who would great the head of the Murut tribe, as they would accept us in their home only then. No one volunteered. So, AK declared- the person with red umbrella would be the leader. He was Ming, a young man from China traveling with his bride to be! We would be visiting 5 tribal homes that of Dusun, Rungus, Lundayeh, Bajau and Murut in that order. Lundayeh and Murut were head-hunting tribes of the past. AK said there are 32 tribes in Sabah in all. We crossed a bridge over a small river to head to the village. Our first stop was by a platform outside a Dusun home. Harvest was stored there. Then AK pointed out to a head hanging there along with crop! He pacifies us quickly, saying the head is MIC, made in China. AK said head hinting probably started in Sabah because sea gypsies would steal harvest from the land people. Fed up, one day someone cut off the head of a sea gypsy and hung it by the storage area as a warning to others- steal our crops and we would cut your head! We went inside the house after listening to this chilly story. The house was pleasing to look at but rustic. 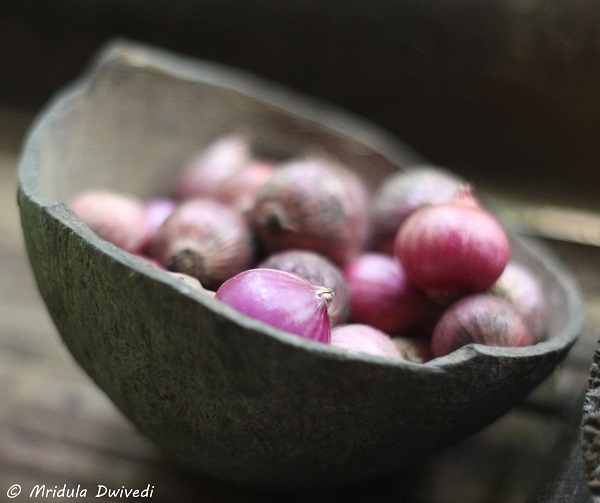 The food styling was superb throughout. I kept clicking all the kitchen displays! There was an attic in the house with a ladder leading to it. I asked what was it used for? AK said it was the bedroom for the unmarried daughter of the house. After she went up in night, the father would take away the ladder and put it in his room! We were offered rice wine in the house. As we moved to Rungus home, we were offered rice cooked with chicken in a bamboo. I gave it a pass. Throughout the trip we would be offered things to eat, honey, pandan juice, snacks and more. It was fun. The rain had stopped by now. Umbrellas became more of a walking aid. Some of the tribes live in long houses. 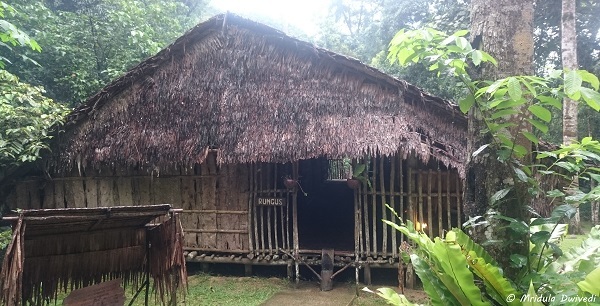 As the name suggest, the house is long and the entire tribes used to live in the same house. More rooms would be added for new family members. Young unmarried men would usually get to sleep in the common areas, rooms were for married people. And I have already told you where unmarried girls slept! 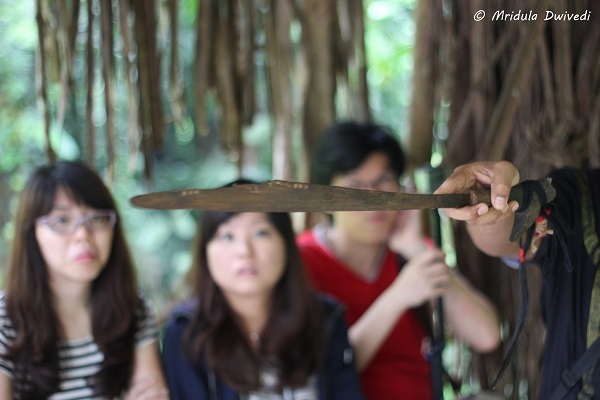 Our third stop was at the Lundayeh tribe which was one of the head hunting tribes of Sabah. AK said that they would however go headhunting only in war. 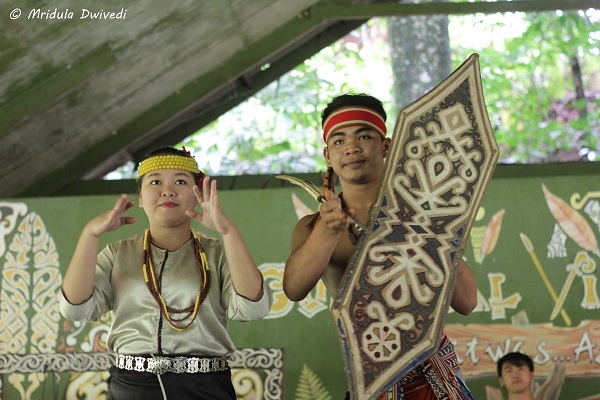 Murut were the ones who would do it for sport too! There were photo opportunities at every stop! 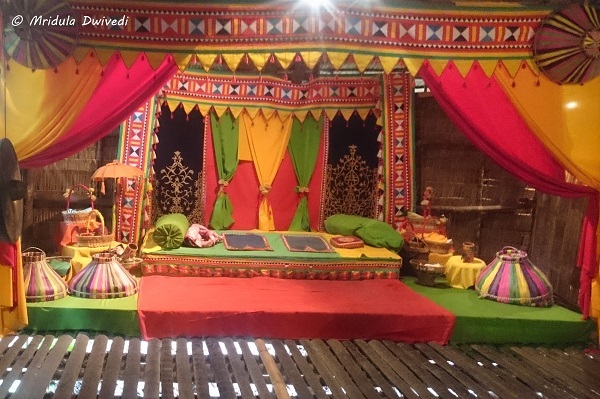 The first photo in this post was clicked with people depicting Lundayeh tribe! Bajau were the sea gypsies of Sabah. AK said he belonged to the same tribe. They had the most colorful home of all the five tribes that we saw. The colorful pavilion was a wedding set up. AK told us an interesting story about Bajau tribes. He said once a child was three months old, the sea gypsies would throw the baby to the sea. This was a practice hundreds of years ago. If the child didn’t swim, they would let it drown! He said some Bajau people still throw their babies to the sea but they would run after the child with outstretched arms saying, “My baby, my baby” if s/he didn’t swim! They no longer let a child drown. We went to the Murut home last. We were given an opportunity to blow darts on an effigy! I managed to hit the chest of the straw man, not very impressive, one had to get the throat! AK was an expert at it! Inside the house was a lot of fun. They had a rattan trampoline in the middle. The traditional purpose was to keep the youth indoors as the tribe had a lot of enemies. So it was better if the kids played inside. 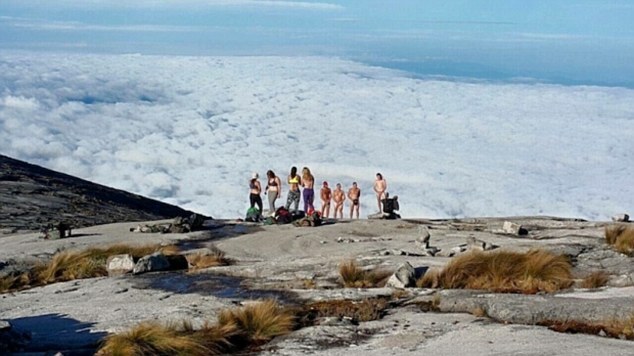 The local lads can jump up so high! We had a fire making session using bamboo sticks and soft bamboo shreds! It was easy for the experts! Apparently a woman would get married if she could make fire and a man when he had hunted a few heads! We were given henna tattoos too! Original tattoos involved piercing with thorns and then sealing the design with bee wax. I was happy with the alternative arrangement of henna! The Bamboo Dance from Mridula Dwivedi on Vimeo. After this we moved to the hall for the cultural show. Without saying much, I present the video of the spectacular bamboo dance! We were given a chance to do the dance too. The tempo was so slow and yet I would get my feet caught regularly between the bamboos. 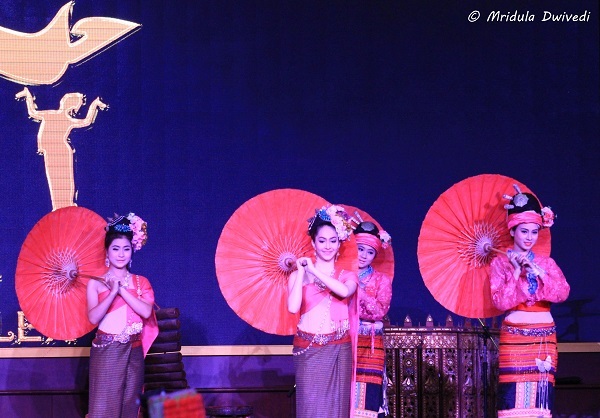 The other performances were colorful too, but the bamboo dance was the highlight. It was performed the last. Now lunch was the only thing left on the agenda! They managed to find things for vegetarians too. 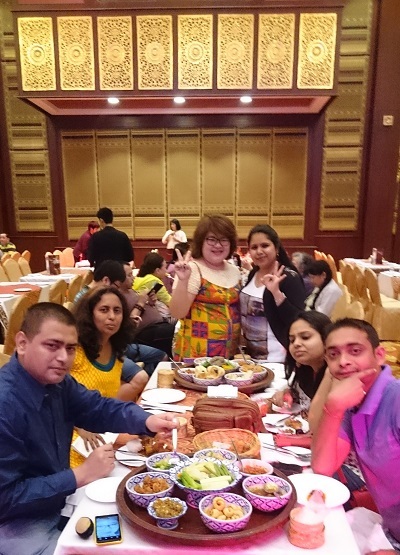 I had spring rolls, stir fried vegetables, omelette (I eat eggs), finger chips and fruits. 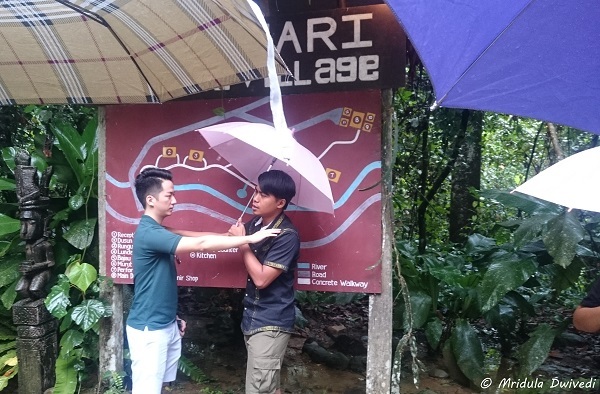 I went to Mari Mari Cultural Village expecting very little but I came out quite impressed and a little more knowledgeable about the tribes of Sabah. PS. My trip to Kota Kinabalu was sponsored by Silk Air. 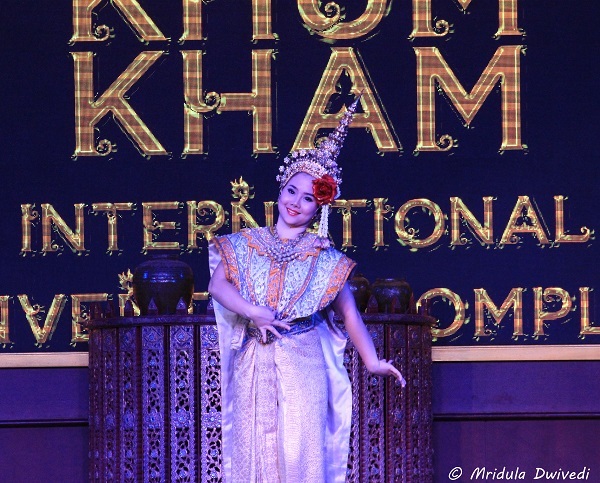 Khum Khantoke in Chiang Mai is a popular restaurant serving the traditional Lanna dinner along with a vibrant cultural show. 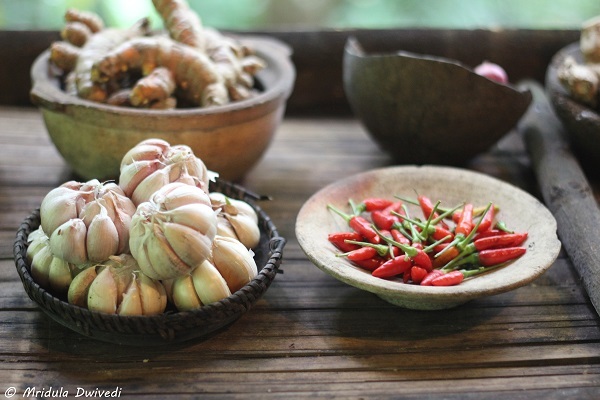 Khum means a wooden pavilion and Khantoke is a circular plate which contains many dishes. Traditional khantoke is served while the guests are sitting on the mats on ground! Modern ones can be served on a table too. 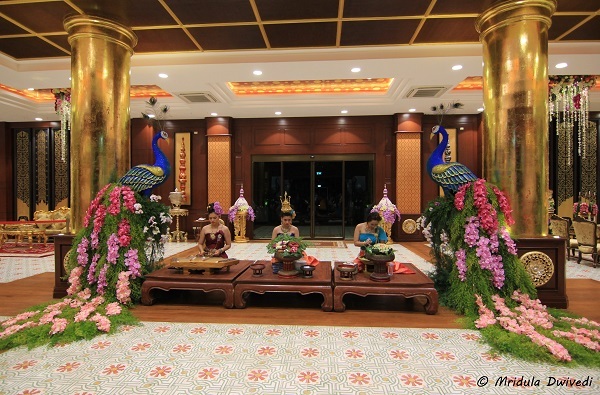 Khum Khantoke has both outdoor and indoor halls. The day we visited it rained, so they used one of the indoor halls. The place has a beautiful ambiance, it was pleasant to walk around the grounds after the rains. 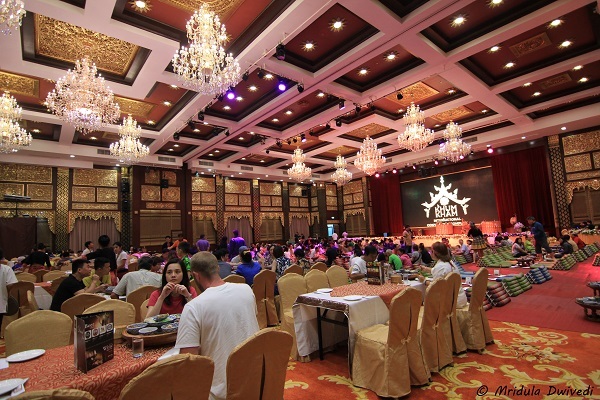 The lobby of the indoor hall was grand. I was quite mesmerized with the peacock arrangement. I spent quite sometime to get a better picture of the setup. It was quite popular with the guests, everyone wanted a picture there. The hall itself was huge and nicely done. I was told it can seat 800 people. There were both, the low floor mats and dinner tables. Our reservation was for the dinner table. As a few of us were vegetarians our table had both the khantokes. The idea was to take the sticky rice, dip in in various curries and it eat with side dishes. The drinks are extra. I had a beer with my meal. The opening sequence (first image in this post) was opulent and graceful. I wish I knew more about the dance but then spending one night at a restaurant is never going to be enough to learn! 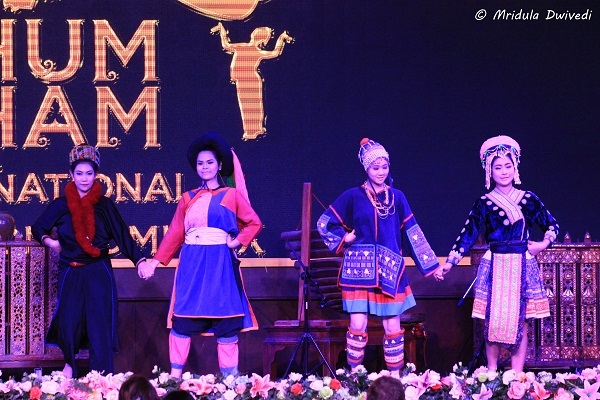 For me the cultural show was the highlight of the evening. There were Lanna tribal dances, umbrella dance, group dances and much more. 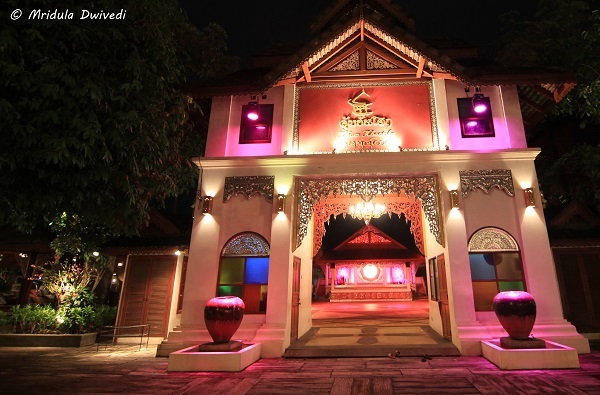 Lanna is the culture of the people of North Thailand. 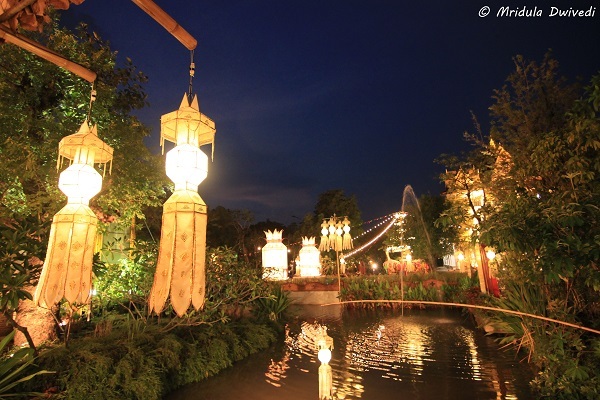 Chiang Mai is also called the Rose of North Thailand. They presented an act from Ramayana as well. I was surprised when i saw it for the first time in Cambodia. But I am now aware that Ramayana is performed in many countries other than India! 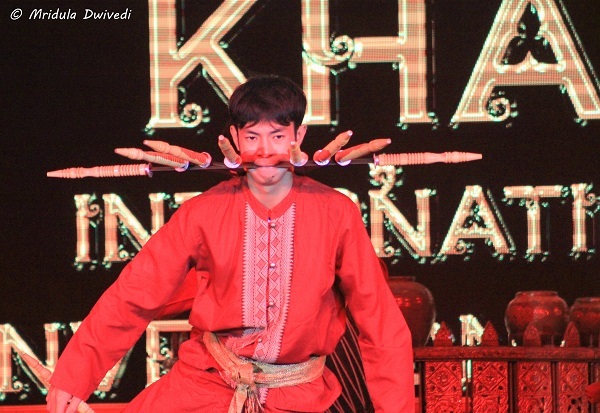 This young man performing with his swords had my rapt attention. I think I held my breath till he took out each one of those safely! While we were enjoying the show two pretty girls went around the tables along with a photographer. They later sell the photograph to you as a souvenir. There is no compulsion to buy. I did bring back mine home. Chhavi quite likes it. The night was pleasant after the rains. We walked out after a beautiful evening and strolled around for a while. I was wondering how it would be to sit outside and see the whole performance. But for the rains that would have been my experience. But I was content with the rich culture that I saw, it would remain the irrespective of the setting.